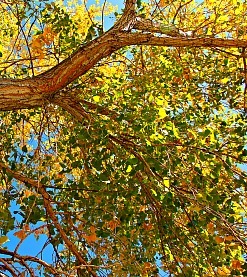 Adore poplar trees, but don't like the mess? Then, you'll love this very fast growing seedless Siouxland Cottonwood tree. Introduced by the South Dakota State University, the Populus deltoids 'Siouxland' is a seedless male cottonwood that doesn't produce the the fluffy seeds. As with other cottonwood trees, the Siouxland is an excellent rapid growing shade tree maturing in the over 50 feet height and 30 to 50 feet canopy or width. Cottonless Cottonwood spreads by root suckers, like Aspen Trees and is known for creating thickets for windbreaks. Siouxland Cottonwood grows in areas from wetlands, along stream banks to help stabilize the soil to well drained and even dry soil. This midwest native tree offers interesting bark making it a good specimen and for naturalizing. Tolerates alkaline soil and pollutants. Great when used as a windbreak tree and for wildlife. Siouxland Seedless Cottonwood quickly grows into a majestic shade tree. Siouxland Cottonwood ships as 18 inch bare root field grown plants.